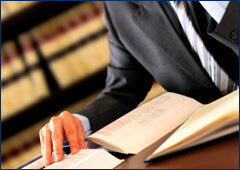 Jesse Gubernat and Thomas Rinaldi of Fort Myers recently completed a liability only trial in Lee County. This rear end accident occurred as Plaintiffs, an elderly couple, were leaving a local Steak and Shake. They 'rolled through' a stop sign and entered the far right lane of a main road in Cape Coral, cutting off a witness who testified during the trial. The witness had to slow down so as not to hit the elderly couple. The Plaintiffs then merged into the left lane thereby cutting off our client. Our client rear-ended the elderly couple. The witness testified that our client was not speeding, but he did not see the brake lights illuminate nor hear any screeching tires prior to the impact. The elderly couple was significantly injured in the accident. Both Plaintiffs demanded our client's policy limits. Our last offer prior to trial was significantly less. After only ten minutes of deliberation, the jury found that our client did nothing wrong and was not liable for this accident. Thus, both Plaintiffs received nothing.